On Saturday morning we do the train-train-bus-bus (surprisingly, the bus from Visp isn't packed and we're the only people on the bus from Niedergrächen to Gasenried) thing and end up in Gasenried. After a short bit on the street (with nice views up the valley and towards the end of the Riedgletscher), the path starts leading us up, up through the woods. Eventually we hit the bottom of the valley and things open up some. 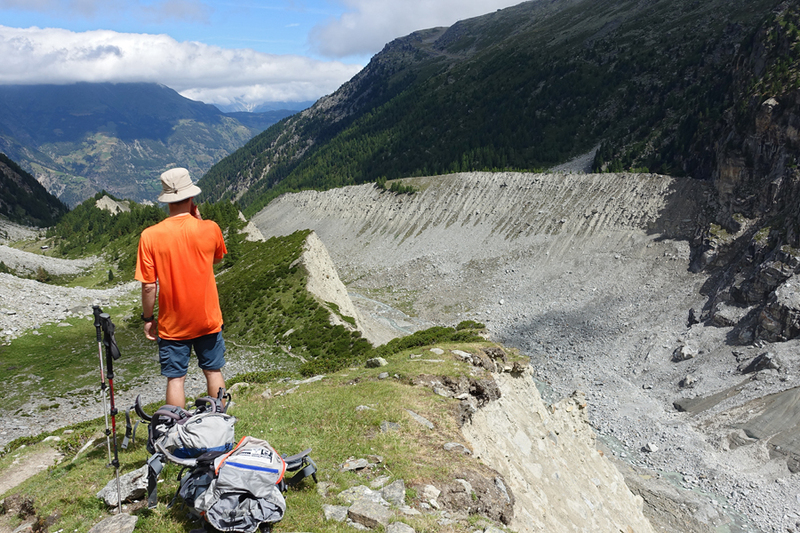 After crossing the river the path heads up onto the moraine and then leads us up the valley. Up, up we go, past Alpja, passing the occasional other group (we definitely aren't alone, no surprise there). Though the view behind us has clouds obscuring a lot of the mountains, in front of us is mostly clear most of the time. After a lunch break on the moraine we continue up, up towards the glacier, past a group wearing city clothes (nice work making it this far up this path in ballet shoes! 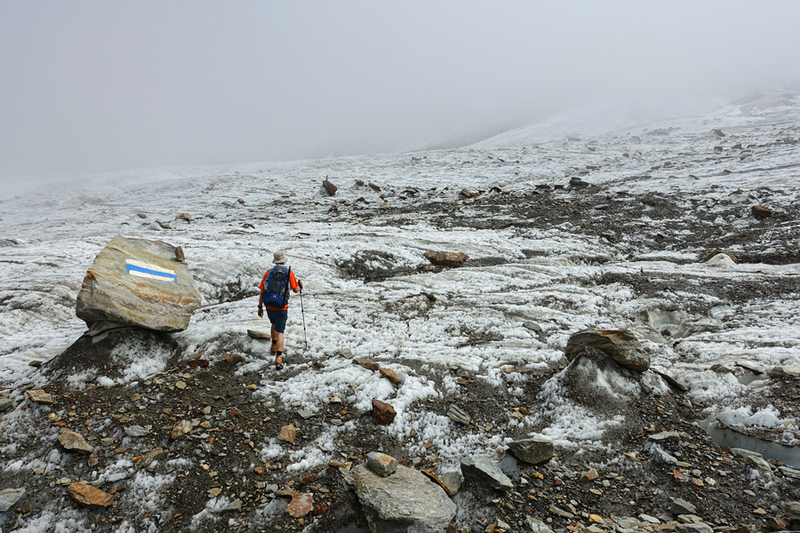 ), past some folks coming down, up, up, up until we hit the edge of the Riedgletscher at around 2700m. At this point we'd normally break out the rope and put on crampons, but since the glacier is completely snow free, the folks at the Bordierhütte set out poles marking a safe path across the glacier. 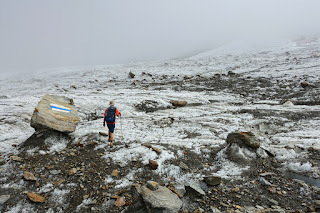 It's pretty cool to hike over the stone-covered glacier at edge, cross stone-filled crevasses, and then cross the glacier itself without needing gear. At the other side a set of metal stairs leads us up off the glacier and a well-established and -secured path takes us the rest of the way to very, very nicely situated hut. 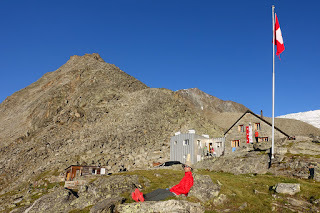 We check-in, mark our mattresses, and then have some cake while enjoying the views across the glacier towards the Dirruhorn, Hobärghorn, and Stecknadelhorn (we can't see the Nadelhorn itself from here) as well as the West face of the Balfrin's North peak. After a nice break we put the boots back on and head out to do a bit of reconnaissance for the next morning. We follow the well-marked (with stonemen and reflectors) path up and around the corner and then turn to the left at the fork to follow the path up to p3146 on the saddle between the Klein and Gross Bigerhorn. This is easy enough to follow and without the packs on we are on the saddle pretty quickly, despite the altitude. 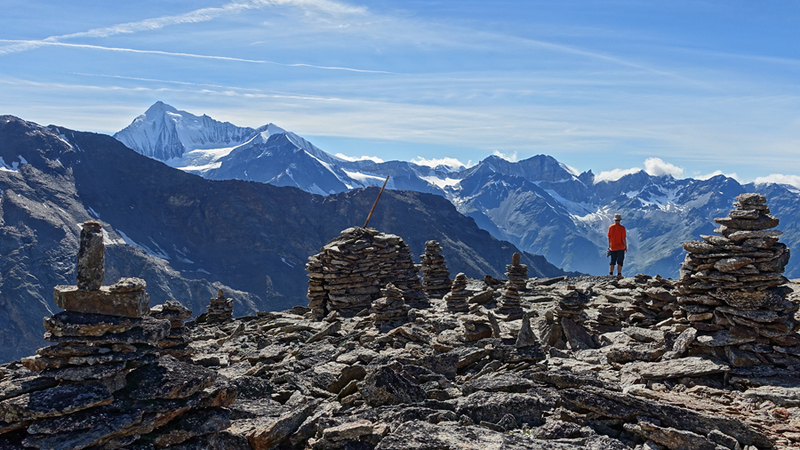 We don't have a ton of time before we need to head back down for dinner, but it's a quick trip to the peak of the Klein Bigerhorn with its fantastic views and loads of cairns (there's even a small shelter). We enjoy the views for a bit and then head back down, passing a couple of groups who are also doing their reconnaissance tours along the way. Dinner is served early (6pm) and the hut gets sun until quite late (almost 9! ), so we spend a couple hours after dinner enjoying the sun and views outside before heading to bed to get ready for the early start on Sunday. Organizing the breakfast time ends up being somewhat challenging. We had read that the hut normally does breakfast at 3 and 7. Since our planned tour for Sunday is long and has a fixed end-time (to catch the last gondola down to Saas Fe), we had planned for the 3am breakfast. When talking to the hüttenwart, we were offered possible times of 2 and 5. 2am is really too early (they're doing this for the group that's planning to do the Nadelgrat traverse, which is quite a long tour) and 5 is definitely too late for us. After more negotiation than seems necessary we convince them to just leave our drinks and breakfast out for us so that we can eat at 4 and then head off to bed.